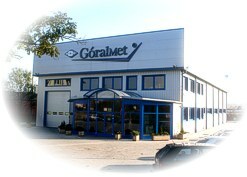 GóralMet ® is an experienced import-export company. We are experts in our branch of business. Quick decisions, special prices and terms together with swift deliveries and professional service, enable our dynamic development and make us a reliable business partner. We know our markets very well, since we have been distributing our products to the markets of the neighbouring countries. Our main markets are: Poland, Russia, Belorussia, Ukraine, Lithuania, Latvia, Estonia, Slovakia and Chech republic.